Many films deal with the threat of a nuclear war; few dare to go ahead and actually portray the detonation of a nuclear device against a civilian population. Half-way through The Sum Of All Fears, a nuclear bomb hidden in a vending machine explodes in Baltimore during the Super Bowl. It is a relatively shocking and brave plot twist, but the aftermath is handled sensitively. Real-life events after Hurricane Katrina proved that the United States is actually a lot less ready to respond to such catastrophes. The Sum Of All Fears gains an enormous amount of momentum from the explosion, and the second half of the film, in which the world stumbles towards all-out nuclear warfare, is injected with heightened tension and urgency. Based on the Tom Clancy book, The Sum Of All Fears hinges on a lost nuclear bomb falling into the hands of European neo-Nazis. They put the device to use in an attempt to trigger an all-out mutually destructive nuclear war between the United States, under the leadership of President Fowler (James Cromwell) and Russia. It is up to the CIA's Director William Cabot (Morgan Freeman) and junior analyst Jack Ryan (Ben Affleck) to intervene in a desperate race against time before all the bombs are unleashed. The movie has its creaky moments and not unexpectedly stretches the bounds of credibility in the interest of Hollywoodizing real-world politics, but director Phil Alden Robinson generally has his hand firmly on the tension dial and smoothly cranks it up with a continuous layering of short, sharp, and effective action sequences. 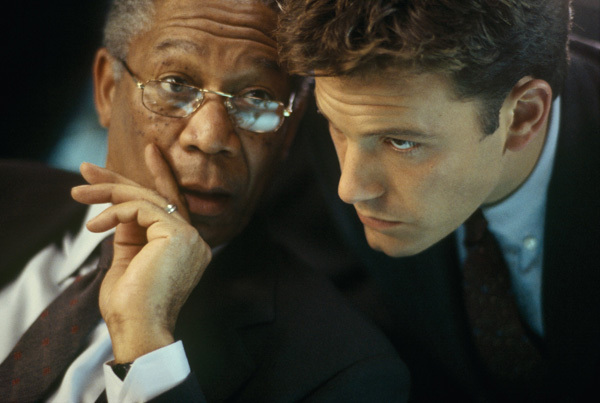 Freeman provides the necessary gravitas while Affleck finds a comfort zone as the young, smart but mistake-prone Ryan. The Sum Of All Fears is never less than gripping, as it finds and delivers a highly satisfying blend of high-octane thrills mixed with reality-inspired geo-political intrigue.